We provide all Ingersoll Rand ARO Diaphragm Pumps, Ingersoll Rand ARO Fluid Products, Ingersoll Rand ARO Expert Series Pumps (EXP), Ingersoll Rand Pro Series Metallic and Non-Metallic Pumps, Ingersoll Rand ARO Piston Pump Packages, Ingersoll Rand ARO-Flo Series, Ingersoll Rand Specialty Application Pumps, High Pressure Pumps, Fuel Pumps as well as Waterpumps and Compressors by Ingersoll and Rand. 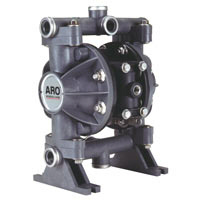 ARO has the world’s best selling 1/2″ ported diaphragm pump!! Designed to meet your OEM application needs!! Ingersoll Rand / ARO Diaphragm Pumps provide stall-free, ice-free operation. Their patented “Unstallable” unbalanced air valve design avoids stalling issues associated with other pumps. Purchase your Ingersoll Rand ARO 66605X 1/2″ Compact Diaphragm Pumps today!